How do I create an annotation? There are two ways to put notes onto your GA interface. The first is to “pull down” the annotations alternative, which you can see right below the graph at the top of your GA screen – it looks like a little handle with a tiny grey arrow on it. The red arrow points to the pull-down in the screen shot below. You only have to click on the “Create new annotation” link to get started at the bottom right of that screen. You can also create an annotation from the graph at the top of the GA screen. 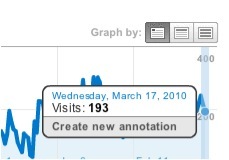 You can see the number of visits on Wed, March 17 in the screen shot below and right under that, an opportunity to create a new annotation. What can I do with an annotation? Once you start to create an annotation, you’ll have the ability to write it (160 spaces and characters), star it if you like (so that you can pull up only your starred annotations down the road), and choose either “shared” or “private.” That last choice is important – anyone who has access to the profile where you created the annotation will see it if you choose “shared.” Only your sign in will have access if you choose “private.” No matter whether you choose to share or not, the annotation creator is the only person who can edit it. What good are annotations, really? Annotations can be used to get the whole organization on board. Here you can see a screen shot of a company has just started to use annotations to let the rest of the company know what Marketing is doing. They even went back and added old annotations so that other departments could learn what Marketing has been doing in the past. We love annotations because not everyone at the company always thinks to tell their consultants what they are doing. When a client runs any kind of advertising, it helps if they use annotations. That way, we don’t waste time trying to figure out the cause of a sudden surge of traffic. Or vice versa – if they one day decide to stop running AdWords or display ads, annotations keep us from panicking about the sudden “loss” of traffic. You’ll love them, too, because you’ll have a history for *yourself* of why those things happened.